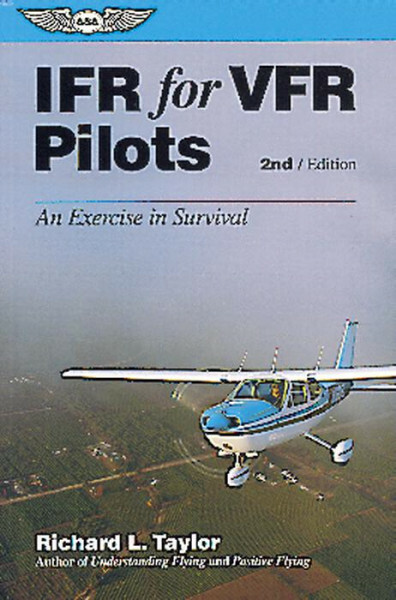 For this "IFR survival guide" Richard Taylor has adapted the key lifesaving elements of IFR discipline to the average VFR pilot's capabilities. Here are complete instructions in a simplified "hands-off" flying technique that minimizes the risks of loss of control when outside visual clues are lost. The physiological causes of spatial disorientation are explained, giving valuable insights into IFR's most treacherous aspect. A chapter contributed by noted pscyhologist and flight instructor Dr. Jerald Cockrell tells how to control fear and panic the cockpit. Should Air Traffic Control assistance be necessary, IFR for VFR Pilots tells how to communicate effectively and how to use ATC to fly out of a low-visibility predicament. The book guides you step-by-step through the essential procedures of DF steers, radar vectors, and other ATC assists. VOR and DF fixes, VOR approaches, low-visibility landing technique, even the missed approach, are clearly explained with typical Taylor expertise. IFR for VFR Pilots is a must for all fair-weather fliers, however proficient and cautious they may be. Its no-nonsense approach has a lot to say to the seasoned instrument-rated pilot as well.